It's no secret that whiskey in nearly all of its delicious forms is having a terrific run right now, benefitting from the boom in traditional cocktails across the US and internationally. The renaissance of cocktails such as the Manhattan and the Old Fashioned has contributed to the growth of bourbon especially. What's most interesting to us is that the category's success has been broad-based across segments and features a wide moat of dynamic and high-growth brands. Whiskey is on the right track in every sense and we think that category momentum will likely continue into the foreseeable future. The State of the Union for American whiskey is indeed strong. 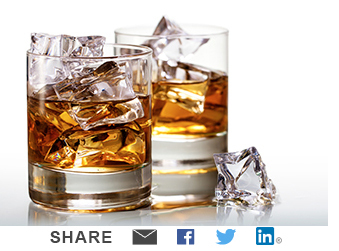 The success of whiskey is in contrast to the recent performance of the vodka category. As we tackled in our recent Vodka State of the Union, vodka's good-but-not-great category performance in recent years has been supported entirely by the explosive growth of three brands, Tito's, New Amsterdam and Svedka. Net of those brands, the performance of the category has been tepid with many of the top brands owned by the global players in market share and volume reverse. Fortunately for whiskey, the top brands are growing along with a myriad of smaller entries, especially in the high-end. Whiskey is also proving inviting for craft distillers who focus on small batches and various types of high-end liquids. There's a lot still left to do. Let's dig deep in into our proprietary database, DrinkTell™, and look at the data. Whiskey on whole has grown consistently this decade, reaching 55 million cases in the U.S. in 2017 from a base of 47 million cases in 2011, a CAGR of +2.7%. This compares favorably to overall spirits growth of +2.0% and to that of category leader vodka at +1.8%. While vodka still retains its throne as market leader with nearly 1/3 share of overall spirits consumption, whiskey has gained ground this decade. Vodka lost 0.5% share points of overall spirits since 2011, settling in at 31.8% in 2017. In comparison, overall whiskey has gained nearly a full share point of spirits, rising to 24.5% in 2017. Of the nearly 26 million cases added to the total spirits industry since 2011, 8.1 million, or 31%, have been from whiskey growth alone. We love the Magnificent Seven of Whiskey. This decade, seven big brands have been the most successful at creating volume growth for the category. Our Magnificent Seven includes Irish leader Jameson and Straight American Whiskey brands Jim Beam, Evan Williams, Maker's Mark, Jack Daniel's, Bulleit and Woodford Reserve. These brands now represent more than 17 million cases, or 30% of overall whiskey. Since 2011, these brands have combined for 70% of industry case growth. These are astounding numbers. As good as American Whiskey has been, the category star is Irish. Pernod-Ricard's struggles to get Absolut back on track in the U.S. are well-known, but the company is riding a rocket with Jameson's. We think the reason behind the explosive growth in Jameson's popularity includes many dimensions with it tough to pin down any single attribute, but whatever Pernod has done worked. The brand has reshaped the category, recruiting young hipsters to put down their PBRs and IPAs and find a taste for whiskey. Jameson's grew by an eye-popping 1.9 million cases from 2011 to 2017, growing its volume base by 2.5x during that period. The good news for Pernod is that there doesn't appear to be any slowdown ahead. From a segment standpoint, Irish and Straight American whiskies are driving growth while Canadian and Scotch whiskies have managed to hold on to volume in the face of fierce competition from within and outside the category. Although Blended American whiskies are lagging, it is a relatively small segment and the shift of consumption from Blended to Straight American whiskey has been a net positive for American whiskies overall. So we don't necessarily see this as a problem as Blended whiskies tend to be more value-driven than Straight and this fits well into the overall trend of premiumization we see across most beverage categories. Within Scotch, which has been trending down slightly this decade, we see higher-end Single-malts growing at the expense of less expensive Blended varieties. Canadians have trended down slightly as well, but it must be noted that we include Diageo's Crown Royal flavor extensions as cordials/liqueurs. To put this in context, Crown Royal Regal Apple jumped from 115,000 cases in 2014 to 1.1 million cases in 2017 and Crown Royal Vanilla joined the game with some success in 2016. To Diageo's benefit, it appears that the flavored versions have not significantly cannibalized the flagship Crown Royal brand. Strong marketing and an evolution to the high-end continues. As we noted in our report BMC's US Spirits Guide 2018, in the Straight American whiskey segment of the market, most of the important consumer-facing activity has been in the upper price tiers. Straight American whiskey has grown at home and worldwide, which has prompted distillers to release hand-selected barrels and high-end whiskeys with limited-release offerings. These are great branding instruments and typically sell out quickly. Brands like Maker's Mark increased volume with line extensions like Maker's 46 and Maker's Cask Strength. Jack Daniel's - the category leader - added iterations like Jack Daniel's Sinatra Select and Jack Daniel's Single Barrel Reserve. Regardless of new tariffs, the underlying fundamentals are sound and the consumer is buying. We examined the threat to high-end whiskey both at home and abroad due to new Trump Administration tariffs in our recent article I'll have a Bourbon with a splash of tariff. However, we see this threat as minor when balanced against category fundamentals. Whiskey just keeps going from strength to strength and we expect the barrels to keep rolling.